Eamonn O’Reilly was unanimously re-elected as Chairman following a vote of ESPO’s General Assembly in Brussels on Wednesday afternoon. E. O’Reilly has been chairing the organisation during the last two years. The General Assembly also re-elected Annaleena Mäkilä and elected Zeno d’Agostino as Vice-Chairs. Ms Mäkilä is currently Managing Director of the Finnish ports Association and has been Vice Chair since 2014. Mr d’Agostino is President of Assoporti, the Italian Association of Ports and President of the Port Network Authority of the Eastern Adriatic Sea. Z. d’Agostino replaces Bernard Mazuel (UPF-France) who has been Vice Chair for the last four years. 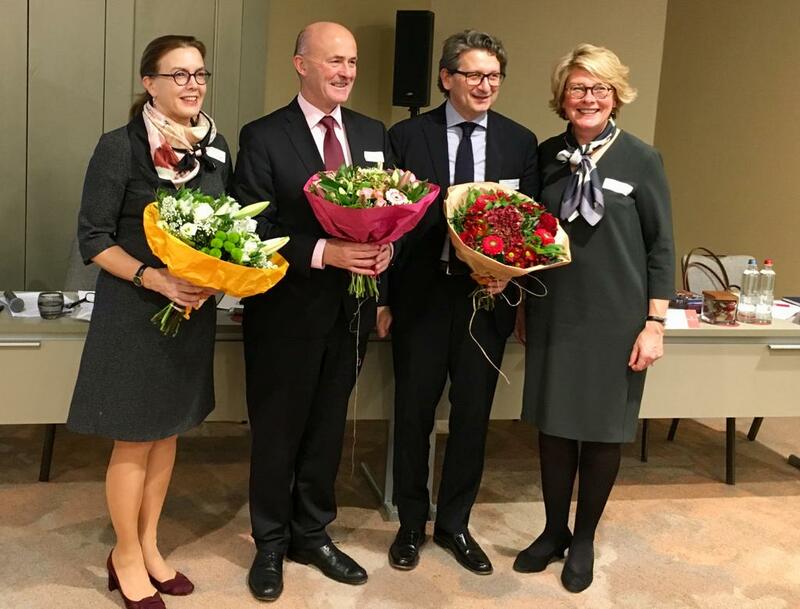 Upon his election, Mr O’Reilly said: “I am very honoured to have been asked by my colleagues in the European port industry to continue as Chairman of ESPO for another two years. ESPO is a creation of the movement to realise the Single European Market and for 25 years has represented the interests of our industry in dialogues with the European institutions. The EU and ESPO are much changed over this time and new challenges lie ahead. The first 25 years of ESPO has coincided with the creation of the legislative framework for Europe’s ports. The next 25 years will be more about implementation. This change of emphasis sees ESPO adapting to the needs of its member ports with value-adding initiatives such as EcoPorts, PortinSights, the new Port Business Platform and the now ten year old ESPO Award promoting port-city integration. These initiatives will be of increasing importance in the years ahead as ESPO and the EU respond to the forces of change." Mr. O’Reilly has been serving as Chief Executive of the Dublin Port Company since 2010. During its General Assembly, ESPO also published its Annual Report 2017-2018, which outlines the activities of the organisation over the past year. A copy of the report can be found here. ESPO also congratulates Port of Dublin (Ireland) for renewing EcoPorts’ environmental management standard (PERS). 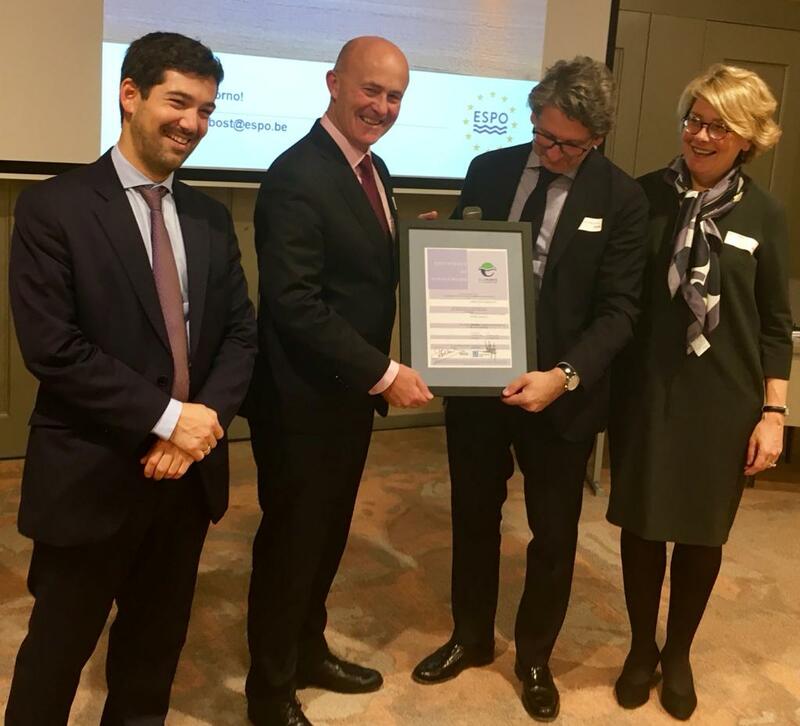 Isabelle Ryckbost, ESPO’s Secretary General, Sotiris Raptis, EcoPorts coordinator, and Zeno d'Agostino, ESPO Vice-Chair, handed over the PERS certificate to the port representative during the General Assembly. “PERS has been the flagship of the EcoPorts network being the only port specific environmental standard. The transparency requirements of PERS enable ports to enhance their relationship with local communities and their market reputation within the supply chain. We encourage all ports to join EcoPorts in order to further improve their environmental performance and communicate their environmental policy,” says EcoPorts coordinator, Sotiris Raptis. In addition, tonight will see the celebration of the 25th Anniversary of ESPO and the 10th annual ESPO Award on Societal Integration.